Johnny was a member of Principal Skinner's platoon during the Vietnam War. He was killed near Da Nang in 1969, gunned down while he was writing a valentine to his girlfriend. 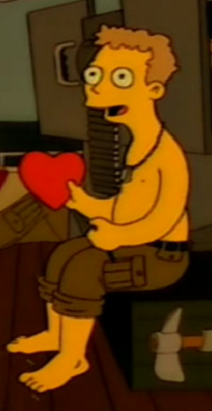 When Bart pranked the school by passing around vandalized candy hearts with messages such as "U STINK", Skinner exposed the prank via the school's P.A. system, using Johnny's story as an example of why Valentine's Day is no joke. Johnny's death appears to have traumatized Skinner. When Skinner told the tale over the P.A. system, he suddenly started shouting Johhny's name and broke down crying. This prompted Bart to gloat, "Cool, I broke his brain!" Modified on September 5, 2012, at 10:26.